a 64-bit image is attached. 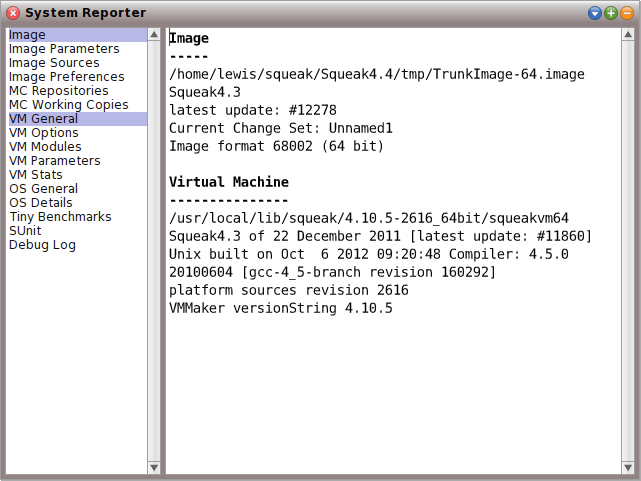 both the "4.10.2.2614 Unix VM" and the "4.10.2.2614 Unix VM for 64-bit images". your image, either 32- or 64-bit. >   	self header: 'Image' on: aStream. > + 		nextPutAll: Smalltalk image currentChangeSetString; cr. > + 	imageFormat := Smalltalk image imageFormatVersion. > + 	bitsPerWord := Smalltalk image wordSize * 8. > + 		do: ["primitive not present in VM"].